Prelux Genoa LED downlights feature a 60° beam angle and an IP44 protection rating, making it ideal for commercial applications including retail and office lighting. Prelux Genoa features a 60° beam angle and an IP44 protection rating, making it ideal for a range of commercial applications including retail and office lighting. Available in 3000K warm white or 4000K cool white this versatile fitting comes in 18W, 25W and 35W. 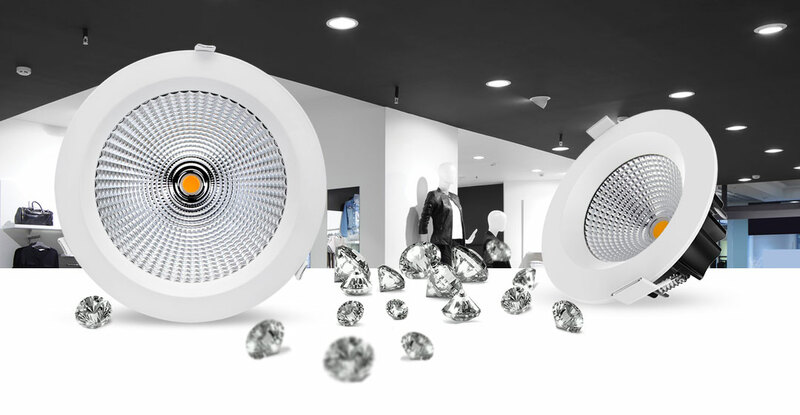 Diamond quality aluminium reflector, lattice pattern. Reflectivity up to 93%, make the light soft, uniform, no black spots. Maximize the efficiency of COB light source. Provides excellent excellent thermal dissipation, conductivity up to 200 W/(mxk).